Impeach Obama NOW / Amnesty Protest in Boise, Idaho | Stop Obama Now!! 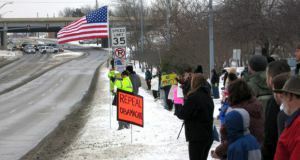 Recent protest in Cedar Falls, Iowa Mad King Obama will visit Boise, Idaho on Wednesday to address his loyal subjects at Boise State University. A local patriot group is organizing a protest. Others are requested to join in. If you belong to a group in the area, please ask your organizer to support this protest. This one is expected to be a great protest with multiple groups joining in. So, don’t miss it! Make Boise proud that you stood up to this historic tyrant.